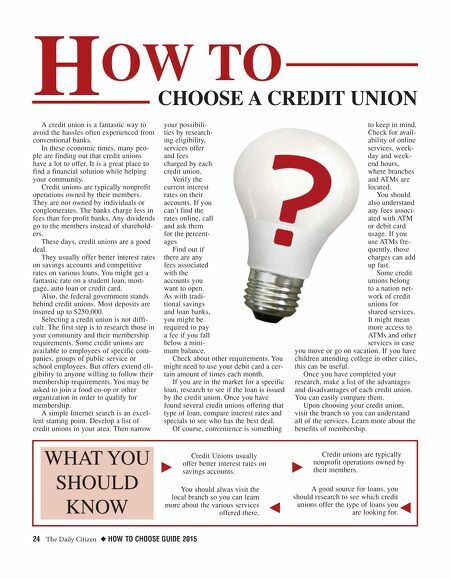 24 The Daily Citizen ◆ HOW TO CHOOSE GUIDE 2015 A credit union is a fantastic way to avoid the hassles often experienced from conventional banks. In these economic times, many peo- ple are finding out that credit unions have a lot to offer. It is a great place to find a financial solution while helping your community. Credit unions are typically nonprofit operations owned by their members. They are not owned by individuals or conglomerates. The banks charge less in fees than for-profit banks. Any dividends go to the members instead of sharehold- ers. These days, credit unions are a good deal. They usually offer better interest rates on savings accounts and competitive rates on various loans. You might get a fantastic rate on a student loan, mort- gage, auto loan or credit card. Also, the federal government stands behind credit unions. Most deposits are insured up to $250,000. Selecting a credit union is not diffi- cult. The first step is to research those in your community and their membership requirements. Some credit unions are available to employees of specific com- panies, groups of public service or school employees. But offers extend eli- gibility to anyone willing to follow their membership requirements. You may be asked to join a food co-op or other organization in order to qualify for membership. A simple Internet search is an excel- lent starting point. Develop a list of credit unions in your area. Then narrow your possibili- ties by research- ing eligibility, services offer and fees charged by each credit union. Verify the current interest rates on their accounts. If you can't find the rates online, call and ask them for the percent- ages Find out if there are any fees associated with the accounts you want to open. As with tradi- tional savings and loan banks, you might be required to pay a fee if you fall below a mini- mum balance. Check about other requirements. You might need to use your debit card a cer- tain amount of times each month. If you are in the market for a specific loan, research to see if the loan is issued by the credit union. Once you have found several credit unions offering that type of loan, compare interest rates and specials to see who has the best deal. Of course, convenience is something to keep in mind. Check for avail- ability of online services, week- day and week- end hours, where branches and ATMs are located. You should also understand any fees associ- ated with ATM or debit card usage. If you use ATMs fre- quently, those charges can add up fast. Some credit unions belong to a nation net- work of credit unions for shared services. It might mean more access to ATMs and other services in case you move or go on vacation. If you have children attending college in other cities, this can be useful. Once you have completed your research, make a list of the advantages and disadvantages of each credit union. You can easily compare them. 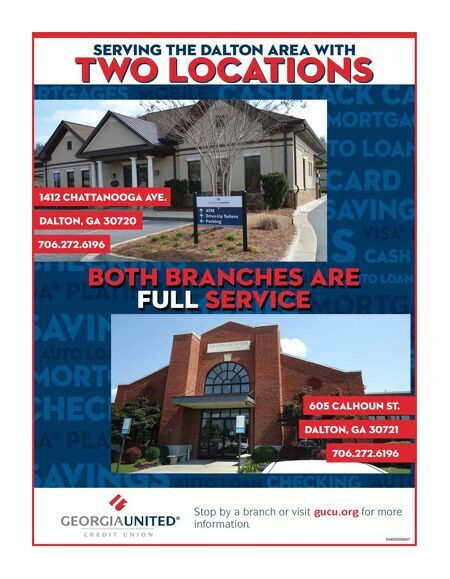 Upon choosing your credit union, visit the branch so you can understand all of the services. Learn more about the benefits of membership. H OW TO CHOOSE A CREDIT UNION WHAT YOU SHOULD KNOW k j Credit Unions usually offer better interest rates on savings accounts. You should alwas visit the local branch so you can learn more about the various services offered there. k j Credit unions are typically nonprofit operations owned by their members. A good source for loans, you should research to see which credit unions offer the type of loans you are looking for.